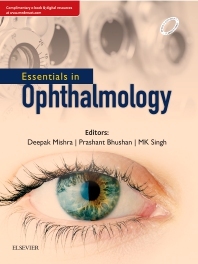 Essentials in Ophthalmology is a textbook that covers the basic and clinical ophthalmology in concise manner, which is written especially for the medical undergraduate and postgraduate students, teachers and ophthalmic practitioners. • Eighteen chapters cover all aspects of ophthalmology, from anatomy to clinical features and management of ocular diseases. • Chapters use clinical images, tables and flow chart for better understanding of the diseases. • Two chapters, “Ocular Examination” and “Ocular Pharmacology, Laser and Instrument in Ophthalmology”, included to address the practical aspect of the examination. • Frequently Asked Questions have been listed at the end of each chapter for theory preparation. • MCQs for self-assessment and Videos of common surgical procedures showing important steps are available online.